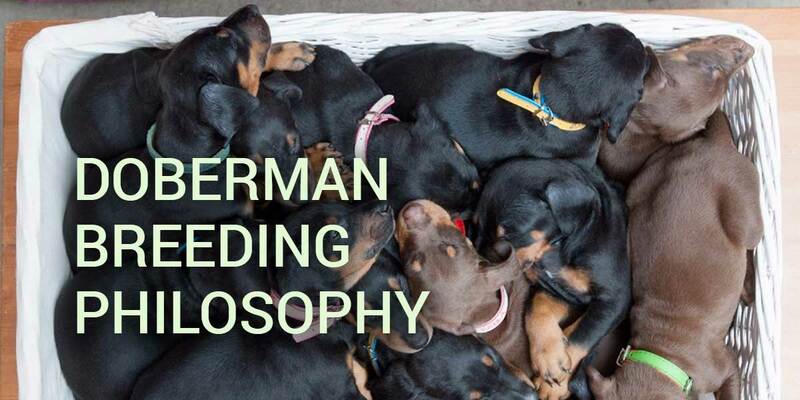 Doberman breeding philosophy - must read - why breeders breed? Doberman breed has 3 major types: working type (Western European or German working lines), European show type (European show with working ability), and American type (American show, no working ability). I cover this topic in more details in my original article Working doberman vs show doberman. 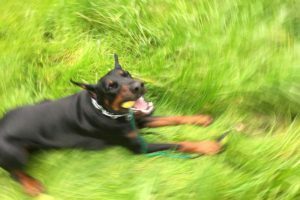 In this article I want to discuss Doberman breeding philosophy and how it affects you as a potential Doberman owner. What is a working doberman? Working dogs, in general, have a natural ability (drive) to perform certain jobs. A Doberman’s job is to protect the owner and his family. All working breed dogs maintain some of the breed-specific traits, but only those, specifically bred for the purpose, will perform in real-life situations. Dogs without proper drive will quickly give up on the job once it becomes difficult or dangerous. Working dogs have great confidence and are driven by the job itself. Such dogs are suitable to serve in police and military. Working dog enthusiasts use such dogs to train in highly competitive dog sports like Schutzhund/IPO (the most popular sport around the World), French Ring, KNVP and others. Working dog sports are usually multidisciplinary and test a dog’s abilities in protection, obedience, and tracking. It requires intelligence and great mental and physical strengths. The video below explains in detail the requirements for an IPO dog. It takes 2-3 years to raise and train a working dog for a competitive sport or police work. Dobermans mature after 3 years of age, which makes their prime age at 4 years old. This is when they start performing consistently well in competitions (or jobs). A sport dog’s career usually ends at 6 years of age. Dog sports have several levels of complexity. For example, in Sch/IPO – the lowest level is IPO1, and the highest – is IPO3. A dog can go through all three levels of IPO within 1-2 years. Once a dog has achieved the IPO3 title and began consistently scoring high in local competitions – only then it can compete on National and International levels. Dogs competing at that level are usually older than 4 years of age. The judging is considered fare in competitive working dog sports: your score is what you’ve earned. Local club competitions are more generous with scores. If you really want to know what the dog is worth – check how the dog performed in Regional, National or International competitions. Working line breeders mainly use titled dogs in their breeding programs – dogs that proved in trials to have strong working abilities. A pedigree of a proper working dog will be full of titled ancestors (mostly IPO3). A proper working line breeding produces consistent results (dogs with proper working drives) and doesn’t require heavy inbreeding to achieve that. Given the long and difficult path in training and competing – majority of working dogs become available for breeding later in life (3-4 years old or older). At that age dogs with poor health start showing signs of genetic diseases (such as DCM – degenerated cardio myopathy). Such dogs (in most cases) are excluded from breeding. Working line breeders are particularly cautious about health of the breeding stock. They want to ensure that puppies are healthy for years of rigorous training and live long to achieve the competing age. Because of the overall poor health of the breed (read about Doberman genetic diseases), there are also breeders that “breed pedigrees” rather than dogs. They want to avoid certain genetics, preserving working drive, but neglecting everything else. The downside of working line breeding philosophy is that it is mainly focuses on one trait – a dog’s ability to bite. This creates dogs that are “nervy” (unstable), unreasonably aggressive, and much less desirable conformation (looks). Show line doberman breeding philosophy. Show line is probably the most familiar type. You might never heard about the working Doberman type before, but I’m sure you’ve seen dogs running in circles when competing in a beauty contest. That’s what show dogs do. Handlers, who show dogs, spend hours training their four-legged partners a proper body movement and posture (stack). In Europe, breed specific shows are very challenging and attract competitors from many countries. It is possible to compete against a 100 other Dobermans for a show winning title. It is a big achievement for the breeder if one of his/her dogs have won the show. Not only as pride, but also financially. A show winning dog becomes highly desirable for breeding and there is no limit how many litters a dog is allowed to sire. This is called a “popular sire” syndrome – there are dogs that have sired over 1000 puppies in their lifetime. Such breeding philosophy significantly narrows the genetic diversity of the breed, increases inbreeding and is one of the main reasons of poor health in the breed. 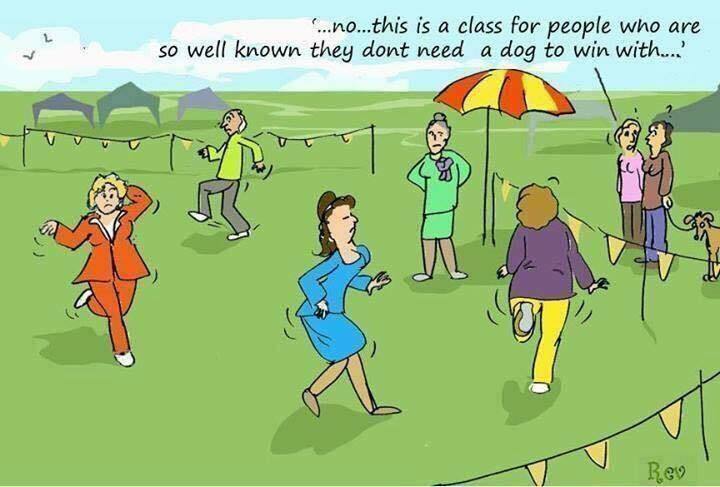 Dog shows are known to be very bias (and in some countries – bought). The looks that one judge favors might not be the same at a different show. It means a Champion in one show might not win the show with another judge (or another country). Show dogs compete in a variety of classes to collect certain amount of points within certain time frame. In most cases – when points are collected, the dog automatically receives the title of a Champion (International or country). Show-winning parents will NOT necessarily produce the next show champion. While all the puppies will be adorably beautiful, only 1 or 2 (sometimes even none) will have a successful show career. The dog must have proper angulations, proportions of the body, height, head, neck, back, tail, color, coat, and variety of other criteria. Even a very promising puppy can develop conformation “flaws” at a later age. To increase chances of creating the next Champion show line breeders rely on inbreeding. They inbreed on famous show winning dogs in hope to recreate and/or enhance certain conformation features. A dog’s show career starts very early – nearly at a puppy age. Many dogs receive highest title by the time they are 1 or 1.5 years old. Show line breeders tend to monetize on the opportunity and offer their dogs for breeding as early as 1.5 years old (sometimes even 1 year old). More conscious show breeders wait till 2 years of age before breeding a dog. This would be an appropriate breeding practice if the overall health of the breed won’t be in danger. Many Dobermans die or show first signs of deadly genetic diseases by 3 -4 years of age. And often by that time they’ve already produced hundreds of off-springs. 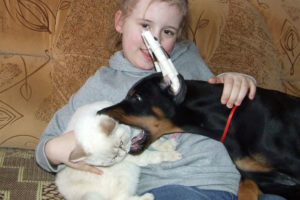 The most deadliest disease for Dobermans is DCM – it has multiple genes and dominant inheritance. When selecting a mating match, show breeders mainly assess conformation (looks). In most cases, breeders compromise everything else in order to achieve the desirable look. Some long-time breeders develop a “signature” look of their lines: a certain head shape, or length of a neck, or stocky body. Sometimes you can recognize a line just by looking at the dog. This can only be achieved by consistent inbreeding on the dogs with the desired conformation. That’s why show line Dobermans have a much higher coefficient of inbreeding. Again, this would be acceptable breeding practice, if the overall Doberman population was genetically healthy. There are show kennels in Eastern Europe, that also assess working drives and overall temperament of the dogs (more about this in Working doberman vs show doberman). Unfortunately, the overall breeding stock in Eastern Europe is in very poor health with rapidly declining longevity. Even knowledgeable breeders can no longer maintain a healthy line. Most all of the nowadays Eastern European dobermans come from 2 females – Tequila Mali del Citone (Italy) and Indira v. d. Rauberhohle (Russia). 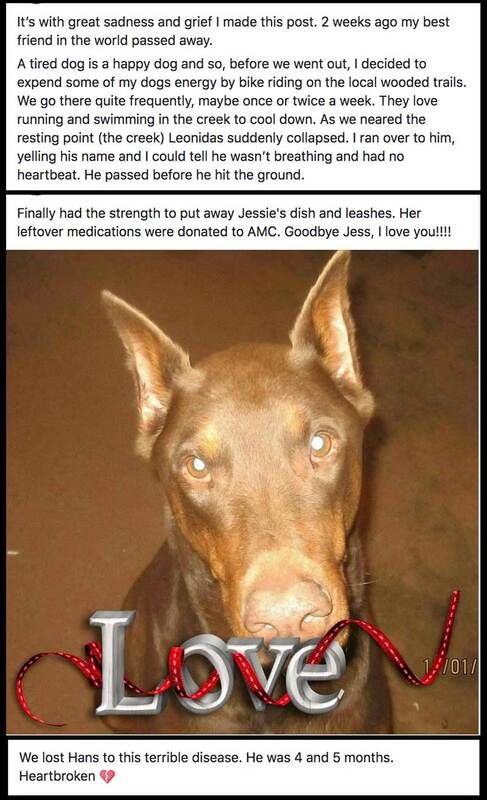 Both of the females died at the age of 5yo or so from DCM (read about Doberman genetic diseases). These females lived about 20 years ago. At this point, both bloodlines got intersected, and the entire population of dobermans in Eastern Europe are so inbred that any two dobermans can be related as full siblings. Such breeding practice exhausts genetics and leads to extinction. There is a great article about extinction of wolves on an island due to high inbreeding and low genetic diversity. Working line breeding philosophy is definitely more health re-assuring. Working line dobermans still have longevity in lines (often 8-10+ years), and have later DCM onset (in comparison to show lines), which gives you more years to enjoy your dog’s company. But focusing only on certain working traits have created dogs that are often reactive, not very appealing in looks, and not as enjoyable partners as show line dobermans. There is no doubt that show line dobermans – strong and proud dogs – have won hearts of many people. But show line breeding philosophy is driving the breed to extinction with its severe inbreeding rates, rapidly declining longevity, and human greed. It becomes a cruel reality, that if you buy a show line doberman you have to be prepared to say good-bye to your dear friend within 4-6 years. Each breeder is driven by certain goals and they have to compromise and take risks. But it is you – as a Doberman owner – who will end up paying for these risks. Emotionally and financially. That’s why it is important for you to understand what drives breeding choices and look thoughtfully into each mating combination BEFORE buying a Doberman puppy. PLEASE NOTE: images and videos are borrowed from Youtube and Facebook.